In this blogpost Professor Mark Connelly discusses The Silent Cities, a1929 publication by Sidney C. Hurst on the cemeteries and memorials of the Great War. When I first visited the battlefields in 1986 I found that my military history interest was very quickly matched, if not surpassed, by a new obsession with the memorials and cemeteries of the Western Front. The first Commonwealth War Graves Commission cemetery I visited was Dud Corner at Loos, and despite seeing many photographs of those neat and tidy corners of a foreign field forever England, I was totally amazed by actually stepping into one. Just like everyone else I found the cliché was absolutely true: the peace, quiet and dignity of the place were truly remarkable. On returning home I quickly managed to find a copy of Philip Longworth’s official history of the Commission, The Unending Vigil, published to mark its fiftieth anniversary in 1967. I read it avidly and was particularly interested in the references to a book called The Silent Cities by Sidney C. Hurst published by Methuen on behalf of the Commission in 1927. Deeply curious as to its contents, I searched my local libraries with no luck and then put in an inter-library search request. In those days everything was done by filling in paper forms and acknowledgement came in the form of a prepaid postcard. After a good few weeks that postcard duly arrived and told me the book was ready for collection. Having no idea of the nature of the book other than the fact that it was obviously about the work of the IWGC, I had no insight as to what I was picking up. Opening the book for the first time I was stunned. First, it was printed on beautiful, glossy art paper. Used to the yellowing and foxed pages of inter-war books I had purchased in my local second hand bookshop or read in the library, nothing had prepared me for opening a volume that seemed brand new. Then there was another huge shock. Rather than pages of text, which I had expected, there were photographs of cemeteries; not just a few photographs to break up and illustrate the text, but page after page of photographs. The book was a gazetteer of each and every cemetery and memorial. Under each cemetery was a short description with details about the graves they contained and map references to aid location. Suddenly I was teleported back to the world of the original visitors to the Western Front or those who longed to go, but with perhaps neither the means nor time who, instead, purchased the book as some kind of permanent souvenir of their lost loved one thus providing a fitting domestic reminder. The book was also a world of liminal spaces for many photographs showed the cemeteries incomplete or in transition. The original Graves Registration Unit crosses could be seen in some rows with others seemingly sprouting up their new crop of pristine white IWGC Portland Stone headstones. Close examination of the landscape around the cemeteries also revealed a world permanently caught in a moment of drastic transition. Look beyond the cemetery and it could have been a shot of the prairie with far, far horizons: the war had destroyed everything and so there was nothing to punctuate the background or immediate hinterland. Most of all, it was a world of saplings carefully planted by the IWGC in the cemeteries or some farmer to help define his field boundaries beyond. Mature trees seemed so rare that their total number could easily be accounted across the entire 407 pages of the book. It was impossible not to play the ‘then and now’ game as I thought about the cemeteries I had seen on my trip and compared my photographs to those contained in the book. Houses, roads, and above all, trees, had appeared in the intervening years. The next great discovery was turning to the back of the book and seeing the index of cemeteries. Having been on the trip I had some inkling of the wondrous range of names used, starting with the severely utilitarian, through the humorous and ironic and on to the elegiac and iconic. But here was a whole new thesaurus of memory and commemoration. Cemetery names tumbled out and rapidly fused in my head a connection with Blunden’s poem, Trench Nomenclature, which I have never since escaped, particularly in that most wondrous of concoctions, ‘Perth Cemetery (China Wall), Zillebeke’. Pouring over the photographs and delighting (that may seem an odd word to use in this context, but I genuinely can’t think of another one which better describes my sensations) in the cemetery names, I saw veterans in tweed jackets, smoking pipes and doffing their caps as they visited the graves of old chums and cloche-hatted women with young children searching for solace in at least seeing daddy’s grave so nobly marked and beautifully maintained. As you’ll know if you’ve read any of my other pieces, that vision is one I have never since managed to shake off and has become an important component of my professional career. Of course, the time came for me to return the book. I dreaded that moment, for I realised then that The Silent Cities was a book that I wanted to own. At that stage I knew absolutely nothing about the workings of the second hand book trade other than the fact that there was a good, rambling second hand bookshop in the London suburb in which I grew up. I did know that I had a rarity on my hands and I was highly unlikely to find a copy in my usual haunt. Aching with the misery that only a teenager can muster, and a teenager at the height of ‘The Smiths’ fame at that, I wondered what I could do. Looking at the library stamps in the book, I saw that no one had taken out since the late 1950s! From this fact I deduced that the library from which it originated might not be that interested in retaining it. Using what I thought to be politely cunning (or cunningly polite) skills I wrote to the library (I have a vague feeling that it was in East Sussex somewhere) and asked whether I might be allowed to buy the book from them, especially as it was clearly not the hottest volume on their shelves. Needless to say that offer was declined with equal decorum and politeness (and perhaps cunning, as well). Skip forward a few years and I was now on the mailing lists of a few second hand book dealers who sent me their quarterly catalogues. Then, one magical day, I saw the book listed in one of the catalogues. I phoned immediately terrified that it might have been snapped up by someone else, but no, I was fortunate and managed to purchase it for let us say a not inconsiderable sum for the early 1990s. Receiving the book felt like having a scoop of soil from every cemetery in Belgian and France; it felt like some holy relic was now in my possession. Something far more than a simple catalogue was now on my shelves. You might therefore imagine the amazing frisson that overcame me, when, about a year later, I purchased a copy of a collection of R.H. Mottram’s essays (of which more in a later piece) titled Through the Menin Gate. Among the short stories, autobiographical sketches and snatches of journalism was a review of The Silent Cities. I made straight for the essay and felt an odd sensation as I realised that Mottram had expressed many of my own thoughts some sixty years earlier. ’The real end of the War came, so far as I am concerned,’ he wrote, ‘on the day that a volume entitled The Silent Cities, an illustrated guide to the War Cemeteries in France and Flanders, 1914-1918, was put into my hands for review. That was the end, there is no longer anything to be done.’ For me though, Silent Cities was not the end but the end of the beginning. This entry was posted in Articles, Professor Mark Connelly and tagged Cemeteries, Commonwealth War Graves Commission, Memorials, Professor Mark Connelly, Sidney C. Hurst, The Silent Cities on August 29, 2014 by zd30. The outbreak of the First World War only had a very limited impact on the town of Folkestone during its opening weeks. Despite the fact that many of its summer visitors had left in a flurry of panic in its opening days, many did not, and the town had also begun to fill with British soldiers ready to embark for the front. However, by the middle of August allied forces had suffered a series of setbacks and its armies were on the retreat along with many thousands of refugees. Many fled westwards, but others attempted to reach the ports of Calais, Boulogne, and Antwerp in an attempt to cross the channel. ‘Gradually at first and very rapidly during the last week or ten days there has been a great change. The town is full, hotels and boarding-houses are crowded, and there is a constant stream of people walking along the Leas. A huge crowd gathers daily outside the closed gates of the Harbour Station and stands there for hours to watch the thousands of people landed every afternoon who pass out to take up their temporary abode here. But it is not the usual holiday crowd which Folkestone knows so well. These sad-faced people, who walk soberly about or gather in little groups and discuss solemnly topics which are evidently of intense interest to them, are not happy rollicking, holiday-makers, nor is their language ours. There is far more French than English heard on the Leas in these days, for Folkestone is becoming a town of refugees’. It was estimated that by 5 September, as many as 18,000 refugees had arrived in Britain through Folkestone Harbour and there was no sign that the numbers would fall. 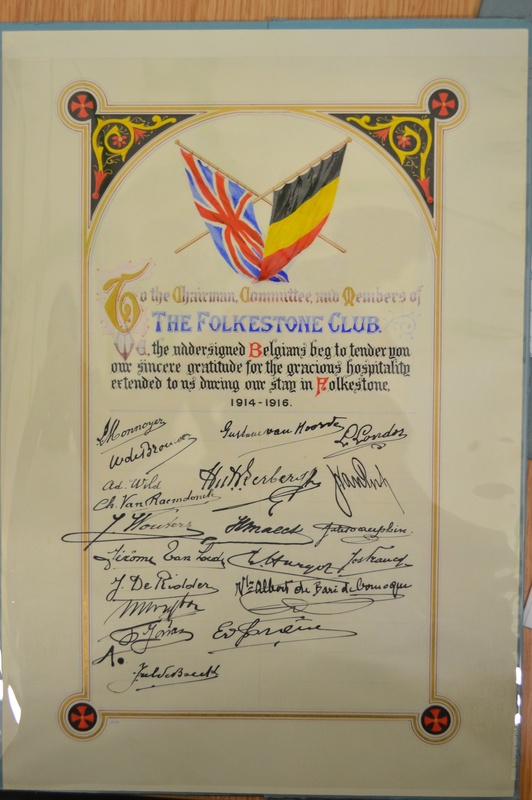 A Folkestone War Refugees Committee was quickly formed in the town and a Belgian Relief Fund was instigated by various newspapers around the country. 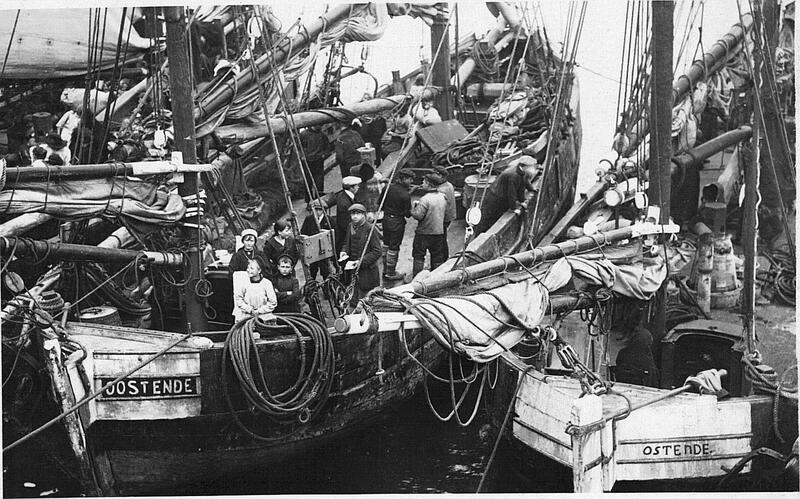 Each refugee was given a medical examination by a doctor before they left the Harbour, some were then sent on to London, and others were found jobs locally, such as hop-picking. Above all, free meals were provided to all who required feeding: as many as 6,000 meals each day. All classes of people had made the journey across the Channel. Many ‘smartly-dressed’ people of the middle classes stayed in the larger hotels and boarding houses surrounding the Leas. The poorer visitors, described as ‘terribly poor’, with little or no luggage were put up around the town in rooms volunteered by many of the townspeople. The Refugee Committee was praised very highly for its endeavours. Described as displaying ‘untiring zeal, cheering drooping spirits, feeding the hungry, helping the helpless, and directing and advising all who stand in need’. The stream of refugees continued almost every day until the middle of October. By this time the town was as full as it would be at the height of the tourist season and few unoccupied rooms could be found anywhere in the town. Over 100,000 Belgians had passed through Folkestone in only a few months and as many as 15,000 had taken up residence. As a result, more funds were required to ensure that they could be cared for over the winter months. Many of the shops had put up signs in their shops advertising in French and a specific paper was printed, Le Franco-Belge, which could keep those who wish to be informed of news from the front. All effort was made to make the refugees feel welcome and comfortable. For many it would be at least another four years until they could return home. The citizens of Folkestone clearly embraced the presence of the new residents. In July 1915, the town celebrated ‘Belgian Day’, to coincide with the Belgian national holiday. The Town Hall and other businesses flew the black, yellow, and red flag, and many Belgian children were seen selling them in the streets. A ceremony was held at the Roman Catholic Church and the Mayor of Folkestone spoke of England’s admiration for ‘gallant Belgium’. Other events regularly took place throughout the war, and the town was visited by many dignitaries as a result of its hospitality to the Belgian people, including the King and Queen of the Belgians who were warmly received. Famously, Signor Franzoni painted a portrait which depicted the arrival of the first Belgian refugees at the Harbour, which can still be viewed in the town. A tablet was erected outside the Town Hall in testimony of the work carried out by the townspeople. Finally, a message was received by King Albert at the end of the war, when a Mausoleum was erected at nearby Shorncliffe Military Ceremony, who stated that ‘Folkestone had earned the admiration not only of the Belgians, but also of the whole world: yes, the whole civilised world knew how the town of Folkestone had received them with such cordiality which would never be forgotten’. This entry was posted in Articles on August 18, 2014 by mrlh. In the summer of 1914, the idea of a major war was far from the minds of the populations of both Canterbury and Folkestone. For both these centres, the summer sun had brought along with it the promise of holidaymakers: the former was host to the famous Canterbury Cricket Week in the first week of August, the latter, a destination for peace and tranquillity on the coast for many thousands from home and abroad. ‘The season was opening; thousands of visitors had flocked to the town, attracted by the health giving breezes from the sea and the charm of the scenery. Passengers crossing from the Continent watch for the white cliffs that stand for England…Little did the happy throng of visitors dream that, just across the Channel, were all the preparations for a great war, that would outrage Belgium and lay waste to the fair fields of France’. Almost immediately visitors, alarmed as to their safety, swiftly packed their bags and left the town, as The Times reported ‘leaving the townspeople bewailing the fact that their season had been ruined’. The news had ‘cleared the town of Folkestone as effectively as though a plague had desolated her homes’. Within a week though, the Mayor of Folkestone, Sir Stephen Penfold, stated that, except for the inconvenience being felt throughout the country, Folkestone was in a normal state- amusements were as usual, the food supply was ample, and while there were still many visitors in the town, there was room for more in comfort! However, Carlile recalled that, by this stage, bands continued to turn out on the Leas, but no one was there to listen as the boys were enlisting, and women were asking what they could do to help. A further issue (and to many another inconvenience) lay with the fact that the town had a large number of Germans and Austrians in residence, many working in hotels and guesthouses in the area. Within days many were prepared to answer the call back at home and attempted to leave Folkestone through the Harbour. A small scandal was created by the fact that some were permitted to do so, but this was soon stopped when Folkestone was designated a Prohibited Area. Scuffles even broke out between French and German men trying to board the same ship to Boulogne. In Canterbury on 4 August, where the usual preparations had been made for what was the biggest social event of the year, the streets shone with twinkling lights and Japanese lanterns hung on many street corners. Initially, there was no rush to leave as there had been in Folkestone, in fact, large crowds attended the first match at the St Lawrence Cricket Ground, and the Regimental Silver of the East Kent Regiment was on proud display, as it always was during Cricket Week. After the two matches (Kent had lost to Sussex, and then beat Northamptonshire in the second), the usual evening entertainment was available to the many visitors all around the city. By the third day, however, the crowds had disappeared. Entertainment was difficult to find, in large part due to the fact that many of the bands were made up of military reservists who had been mobilised on the declaration of war. The army took over the Cricket Ground and Canterbury Week came to an unceremonious halt. Although there appears to have been no initial great enthusiasm at the immediate outbreak of the war, both population centres soon found themselves greatly affected by it. Owing to the fact that Canterbury was home to a large barracks, it was soon inundated with military personnel, many of whom had to be billeted throughout the city. This was to remain the case for the duration of the war as men and women passed through, either on their way to the front, or on their return, many of whom were wounded and treated in the many VAD hospitals in the vicinity. For Folkestone, the harsh realities of war were very quickly to present themselves to the population of the town in a variety of ways. Soldiers began to embark ships en-route for France, and many wounded soon began to appear. 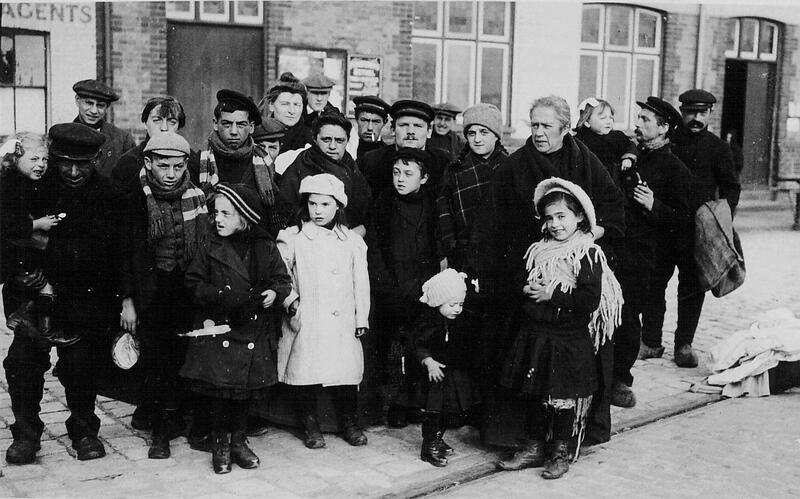 Most strikingly, within the month, the well-worn faces of thousands of Belgian refugees made their way along the Harbour arm and would become a prominent feature of wartime life in the town for the next four years. This entry was posted in Articles and tagged August 1914, Canterbury, Canterbury Cricket Week, Dr Will Butler, Folkestone on August 4, 2014 by zd30.